I’ve always loved my city and today I love it more than ever. 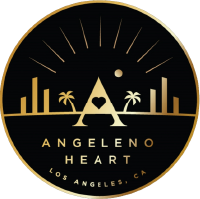 Anyone who is close to me also knows how crazy I am about old L.A relics and about the situations I’ve put myself in, just to get a solid story for Angeleno Heart. A little over two years ago, way before Instagram was even a thought to me, I was sitting at my kitchen table trying to depict my version of this beautiful city in a drawing. I came up with something decent, but not professional. I decided to look for an artist on Craigslist and soon found one. His name is Ive Grgas and he goes by @magikcircles on Instagram. Check out his work – he is a true artist. This is the original drawing he came up with after I gave him my sketch. I post this today in its original state because I want you to see the details and the amazing colors that “I’ve” blended in. I’ve printed some black and white ones on baseball jerseys and have handed them out to friends and family. Maybe soon I’ll make more and let you guys know so you can purchase one or a few. I wish I could print them in color, but I’d have to sell them to you for a million bucks. Writing has been a part of me for at least 4 years now, but have taken it more seriously in the past year or so. I’m just a regular 41 yr old with a regular job that likes writing stories. I’m inspired by the city, the buildings and the people in it. Every soul, wall, window, tree and street corner has a story and I hope to continue bringing you more from this beautiful city I call home through Angeleno Heart. A few have been fiction but the majority of them are real. Thank you all for taking the time to read them.